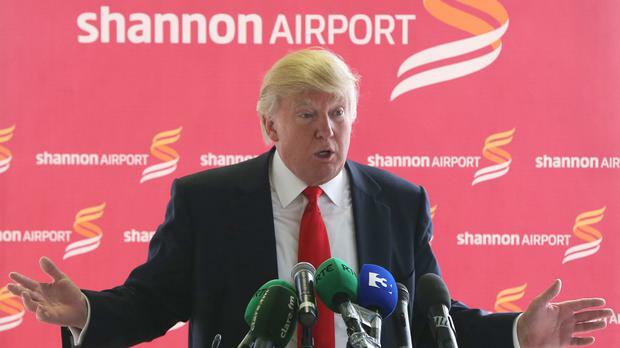 Businessman Donald Trump, the presumptive US Republican presidential nominee, is to visit Ireland. The billionaire announced his trip as part of a whistle-stop tour of his golf resorts later in the month, which will take place after he has been to Scotland. Mr Trump owns the renowned golf links at Doonbeg in Co Clare, on the west coast of Ireland, and is battling to get planning permission for a huge wall to act as a sea defence. The New York tycoon told his 8.6 million followers on Twitter on Thursday night that his trip starts on June 22 and he will be calling at Turnberry and Aberdeen, followed by Ireland. The visit will coincide with US Vice President Joe Biden's trip to Ireland and the result of the Brexit referendum. Mr Trump had already confirmed that he would be visiting his business interests in Scotland. In a series of tweets, he said: "After @TrumpTurnberry I will be visiting Aberdeen, the oil capital of Europe, to see my great club, @TrumpScotland. "After @TrumpScotland, I will visit @TrumpDoonbeg in Ireland, the magnificent resort fronting on the Atlantic Ocean. "Then, on June 25th - back to the USA to MAKE AMERICA GREAT AGAIN!" The red carpet was rolled out for Mr Trump when he visited Ireland after buying Doonbeg in 2014. Finance Minister Michael Noonan also greeted him off the plane. But it is not clear what reception will be laid on for him in government circles this time after Taoiseach Enda Kenny made a damning criticism of his attitudes to immigration and branded some comments from the presidential campaign as "racist and dangerous". Mr Trump is expected to be formally named as the Republican nominee for the White House at the party's national convention in Cleveland, Ohio, in July. Trump paid about 15 million euro for Doonbeg and vowed to invest up to 45 million euro. No stranger to controversial plans for walls, the businessman is awaiting a decision on plans for 200,000 tonnes of boulders on a 2.8km stretch of D oughmore beach where Atlantic storms have ravaged dunes in recent winters. Mr Trump has said he is not a great believer in man-made climate change but cited global warming and rising seas as a reason for needing the wall. Doonbeg, a renowned beauty spot, is protected by strict environmental concerns for a microscopic snail which has been around since the Ice Age - the narrow-mouth whorl snail, or vertigo angustior, which measures about 0.9mm wide and 1.8mm in height. There is also a right of way for surfers through the course. Within hours of his announcement politicians called for a protest. Paul Murphy, People Before Profit-Anti Austerity Alliance TD, said Mr Trump should not be given the red carpet treatment. "Instead there should be a protest to send a clear message that he and his policies aren't welcome here and that we stand in solidarity with the thousands of people from all backgrounds who have protested against him in the US," he said. Mick Barry, also a TD with the group, contrasted the Doonbeg wall with Mr Trump's proposed wall along the Mexican border and the idea of banning Muslims from the US. "They are aimed at scapegoating immigrants and intensifying Islamophobia," he said. Green Party leader Eamon Ryan called for a peaceful, purposeful protest to show the world that Ireland rejects the divisive views espoused by Mr Trump. "We will not meet our common challenges by building walls between nations or by demonising people of different faiths," he said. "We have skin in this game because his efforts to undermine climate action will put us all at peril. "We have an obligation during this visit to say to our Irish-American cousins: 'Whatever you do, please do not vote for this man'."